Figure 10-5.Standard Form 600, Specialhypersensitivity. 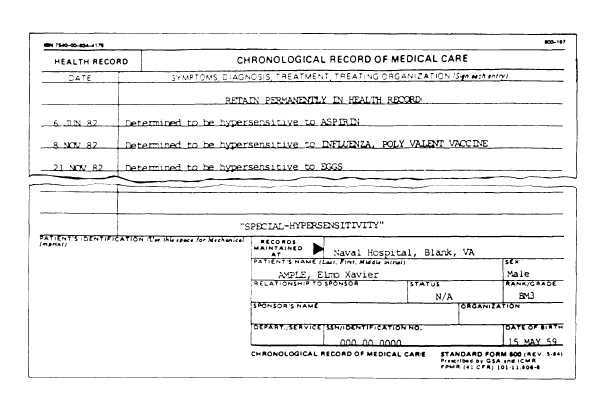 Home > Medical Manuals > Intro Nursing Manual > Figure 10-5.Standard Form 600, Specialhypersensitivity. When a member of the naval service incurs an injury that might result impermanent disability or that results in his or her physical inability to perform duty for a period exceeding 24 hours, an entry will be made concerning line of duty misconduct. Such an entry will include specific facts concerning time, date, place, names of persons involved, and circumstances surrounding the injury. Dental treatment will be recorded when the patient is on the sicklist and when treatment is related to the condition for which the patient was admitted. These entries will be made and signed by the dental officer. Notes concerning conditions of unusual interest and of medical or dental significance may be made when appropriate. When a patient is transferred and radiographs are transferred with him or her, a notation to that effect will be entered on the SF 600 or 502, as appropriate. Results of laboratory examinations made on personnel exposed to radiological hazards will be entered on the SF 600, listing any abnormalities and action taken. Figure 10-5.Standard Form 600, SpecialHypersensitivity. Any hypersensitivity to drugs or chemicals known to exist are indicated on a separate SF 600. The SF 600 will be marked SPECIAL-HYPERSENSITIVITY at the bottom of the page. This SF 600 (fig. 10-5) will be the first medical page on the left side of the health (medical) treatment record below the problem summary list. Appropriate entries regarding hypersensitivity should be made on this page. Hypersensitivities shall also be recorded on SFS 601 and 603. Blood Grouping and Typing Record (figure 10-6). This is a special SF 600 and shall be maintained on the left side below the problem summary list or below the hypersensitivity sheet if used.